MARYSTOWN, N.L. - For a guy who crashed a $2.3-million, one-of-a-kind sports car in a Newfoundland river, Zahir Rana is pretty cool and composed. Video footage of his exploits have generated headlines in Europe and more than a million hits on YouTube since he drove his V-12 Edo Enzo Ferrari into the water during the Targa Newfoundland car rally late last week. "There's a lot of people who follow the sport out there," Rana said Monday. "A lot of people like to see other people get hurt. A lot of people are envious." Cameras caught Rana and co-driver Roland Linder rounding a corner off a bridge and trying to correct as the back end of the car spun out, throwing them through a guard rail and over an embankment into a tidal river in Marystown on the province's south coast. Neither of them were hurt. "When the car went down I thought, 'Now what?' This is my baby," Rana said from his Calgary office, where he is a sports and exotic car dealer. "I was very, very sad when I came out of the water. My mind went blank for about 45 minutes." But Rana says when he finally worked up the nerve to take a look, he realized that his Ferrari, which is made up largely of composites, wasn't that badly damaged. "The front left fender where it hit the rail and the bumper are banged up, but there's very little cosmetic damage," he said. 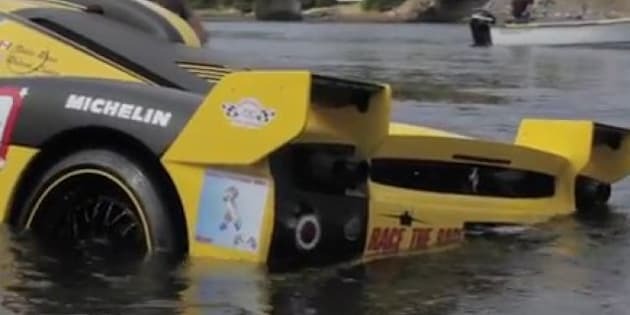 "But the main problem is obviously the car's electronics being in the water." Rana says he and a couple of technicians spent about 14 hours that night stripping down the engine's wires and cylinders after it was hauled from the water by crane. They then lubricated everything with oil to draw out any salty residue. "The car will be fine. It will just need some attention." Rana says he was planning on making some modifications to his 860-horsepower, 392-kilometre-an-hour vehicle this winter anyway, and this would just expedite the process. He says he enjoyed his Newfoundland experience and has every intention of returning to the event next year. Targa Newfoundland spokesman Doug Metham said Rana and Linder weren't part of the actual competition but driving the route as a showcase event. "These are people who didn't want to leave their cars under covers but to enjoy them under controlled circumstances," Metham said. Drivers in Targa Newfoundland, which is modelled after similar rallies in New Zealand and Austrailia, must cover about 2,200 kilometres over five days. The week-long race is run in stages through eastern and central Newfoundland every September.